This town favorite shop was established in 2009 and provides its customers with the kind of stylish beachwear suitable for going out on the town to shop, have lunch with friends, and the like. “We are Mixology Clothing Co. and we believe in inspiring confidence in woman,” said Gabrielle Edwards, the vice-president and head buyer of the store. This store is open year-round and offers women’s clothing, with a separate children’s store location featuring the newest trends. Gloria Jewel is an institution in The Hamptons, beloved by residents and tourists alike. Drop by the boutique to find new and unique pieces. Check out their new arrivals on their website and follow them on Instagram for updates. This high-end designer shoe store that has the perfect pair to complete each of your outfits, no matter the occasion, from casual to sophisticated. Open year-round. If you’re looking for designer jeans, this is the place to go. Whether you’re shopping for yourself or for your kids, Fahrenheit 451 has the brand and size you want. Browse their jeans collection along with a variety of clothing for men, woman, and children. This is a fabulous men’s clothing store with exceptional staff. Customers have raved about the shop’s “great inventory” and service. Drop in to find the current trends, curated just for you. This is your go-to destination for dresses and other easy-to-wear summer outfits like rompers and off the-the-shoulder tops. Popular designer labels can be found here. This village favorite cannot be skipped while you’re in Westhampton Beach. The store will silkscreen, embroider, and affix lettering on your caps, hoodies, shorts, and other apparel. The Westhampton T-Shirt Shop specializes in custom T-shirt designs for a variety of clients, ranging from walk-in customers to business owners. Don’t miss Island Surf Shop. The store’s friendly staff will help you find all the active wear you’ll need for a day at the beach. Surf lessons and camps are also available along with SUP and surf board rentals that will be delivered directly to you. Peace and Love carries high-end lingerie as well as funky, modern, Hamptons-style finds that’s exclusive to the store. Annie, the owner of the business, has a passion for high-quality fashion and unique gifts for men, women, and children. 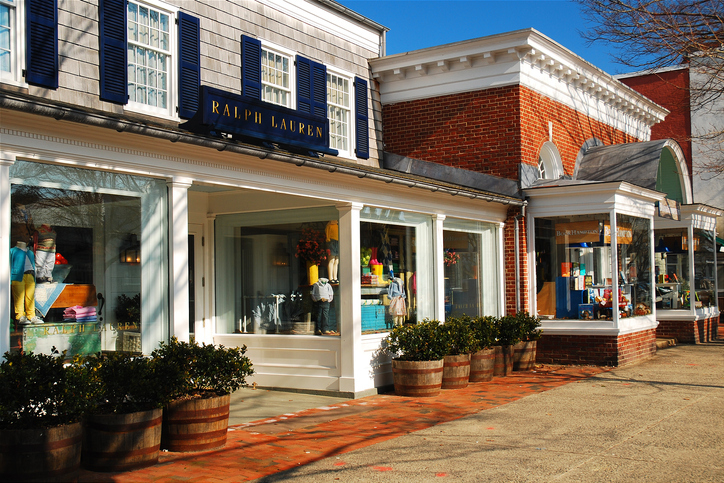 If the trendy boutiques and iconic stores make The Hamptons your kind of beach town, contact Kerrigan Country Realty at 631-288-9600 or broker(at)kerriganrealty(dotted)com. We’ll find you the perfect vacation home in The Hamptons.